By booking now on Jin Jiang website, you will get a 10% discount. Jinjiang Inn Xi'an Jiefang Road is located at Xincheng District, the intersection between Jiefang Road and Xiyi Road (beside Agricultural Bank of China, diagonally opposite to The Fourth Affiliated Hospital of Xi'an Jiaotong University). You can reach the Hotel at Dachaishi Stop by Bus Lines 611, K5 and 41 within only 10 minutes. It is 15 minutes walk to Xi'an Railway Station. From Xi'an North Railway Station, you can take Metro Line 2 to Zhonglou Station, and then take Bus Line 611 to Dachaishi Stop. It only takes 45 minutes to Xi'an Xianyang International Airport and 10 minutes to airport shuttle bus stop by taxi. There are many reasons for you to select the Hotel during your business and travel. Convenient traffic condition there are more than 30 bus lines within 100m of the Hotel that can reach the scenic spots directly: take Bus Line 611 or 201 to Zhonggulou, Hui People's Snack Street; walk 10 minutes to Ancient City Wall, and then take Bus Line 14 to Forest of Stelae Museum; take Bus Line K5 or 30 to Greater Wild Goose Pagoda and Shaanxi History Museum; take Bus Line 306 (Special Travel Line 5) at the Railway Station to Terra-Cotta Warriors, Huaqing Hot Spring and Qin Imperator Mausoleum; walk one stop to Shaanxi Province Government. Abundant Resources. it is located at the Business District of Zhonglou, Minleyuan Wanda Plaza and Dachaishi Wanda Plaza. Shopping: Wanda New World, Wanda Plaza, Minsheng Department Store, Parkson and New-Mart; Supermarket: China Resources Vanguard and Renrenle; Entertainment: Wanda Film Studio, China Film, Dagexing, Super Player; Bank: Bank of China, China Merchant Bank, Agricultural Bank of China, China Construction Bank, Industrial Bank, etc. ; Conference: a large meeting room of 40 m2 can hold 30-50 people; a small meeting room of 30m2 can hold 15-25 people. Catering fast and convenient Xinglianxin Cafe. Unrestricted domestic direct dialing free for local direct dialing and the price for domestic call is only RMB 3/day. Cultural featurecomfortable book bar, free WIFI coverage, unique culture of Jinjiang. 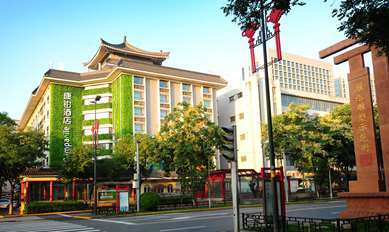 It is a Hotel concerning foreign affairs and is the reception hotel designated by Campanile France Louvre Hotel in Xi'an, which allows you to live in Jinjiang Inn wherever you travel. You are worthy of it. Welcome to Jinjiang Inn Xi'an Jiefang Road Wanda Plaza. Jinjiang Inn Xi'an Jiefang Road Wanda Plaza will celebrate its 8th anniversary in November 2014. For the purpose of thank all the guests for their support and trust, series of special offers will be launched in November for members only (see special area of privileges and selections for details). There will be surprises for you. Welcome to participate in this activity to witness our glory over the past eight years. Welcome to Jinjiang Inn Xi'an Jiefang Road.